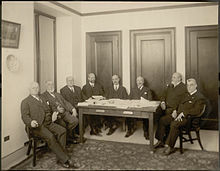 Board of Trustees of the Heye Foundation in 1920, from left to right are: Minor Cooper Keith, James Bishop Ford, George Gustav Heye, Frederick Kimber Seward, F. Kingsbury Curtis, Samuel Riber, Jr., Archer Milton Huntington, and Harmon Washington Hendricks. Archer Milton Huntington (March 10, 1870 – December 11, 1955) was the son of Arabella (née Duval) Huntington and the adopted son of railroad magnate and industrialist Collis P. Huntington who most likely was his biological father. A lifelong friend of the arts, he is known for his scholarly works in the field of Hispanic Studies and for founding The Hispanic Society of America in New York City. He was also a major benefactor of the American Academy of Arts and Letters and the American Numismatic Society, which he convinced to relocate next to the Hispanic Society at the Beaux Arts Audubon Terrace complex in upper Manhattan. In 1932, he founded the Brookgreen Gardens sculpture center in South Carolina; and the Mariners' Museum, which is one of the largest maritime museums in the world, in Newport News, Virginia, a new independent city that was established in the late 19th century largely though the efforts of his adopted father Collis P. Huntington. 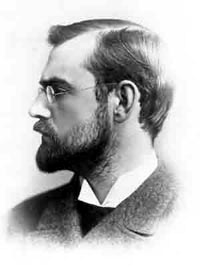 Archer Huntington was married twice. On August 6, 1895, he married Helen Manchester Gates, the daughter of Rev. Isaac E. Gates and Ellen M.H. Gates (his stepfather's sister). Like her mother, Helen was a writer. Archer and Helen were temporarily detained and effectively under arrest by German authorities in Nuremberg, Bavaria, at the outbreak of World War I in August 1914 due to suspicions that Archer, a representative of the American Geographical Society, was a spy. Secretary of State William Jennings Bryan appealed for their release through diplomatic channels. Archer and Helen had no children and divorced in 1918. Archer married sculptor Anna Hyatt on March 10, 1923, and they founded Brookgreen Gardens sculpture center and nature reserve near Myrtle Beach, South Carolina, in 1931. Her large scale sculptures adorn the Audubon Terrace at the Hispanic Society of America in New York City. March 10 was both his and his wife's birthday. They then called March 10 "3 in 1 day" and it is still celebrated at Atalaya and Brookgreen Gardens in South Carolina. Archer and Anna had no children. Huntington is primarily known for his scholarly works in the field of Hispanic Studies and for founding The Hispanic Society of America in New York City. The society, founded in 1904, is a museum and rare books library whose collections of Hispanic materials are unrivaled outside Spain. Spanish impressionist painter Joaquin Sorolla met Huntington in England in 1908. Huntington soon made him a member of the Hispanic Society, and invited him to exhibit there in 1909. This grand exhibition comprised 356 paintings, 195 of which sold. Sorolla spent five months in America and painted more than twenty portraits. 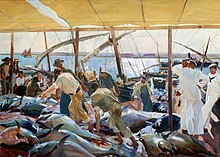 Ayamonte or La pesca del atún (1919). This is the last of Joaquin Sorolla's 14 murals completed for the Hispanic Society in Manhattan. In 1911, Huntington contracted with Sorolla to paint 14 magnificent murals that came to be known as The Provinces of Spain. These are considered to be the major commission of Sorolla's career. His enormous canvases hang in the Sorolla Room of the Hispanic Society building in Manhattan; the room was opened in 1926 following Sorolla's death. A major restoration of this room was completed in 2010. During the restoration of the Sorolla Room, the murals toured major art museums in Spain. Huntington's wife, Anna Hyatt Huntington, sculpted the bronze statues and limestone bas-reliefs that stand outside the entrance to the Hispanic Society building. In 1915, Huntington donated land on which the American Academy of Arts and Letters could construct a permanent New York City home. The land was adjacent to the Hispanic Society. He also donated land and funds to relocate the Numismatic Society and the Museum of the American Indian to the same complex, Audubon Terrace. The Huntingtons' Brookgreen Gardens, the setting with sculpture 'Athlete' by Rudulph Evans (1915). In 1932 he donated land and helped to create Brookgreen Gardens in South Carolina, a public sculpture garden in which to display the figurative sculpture works of American sculptors, including many pieces by Anna Hyatt Huntington. A portion of Brookgreen Gardens is a nature reserve, and another section is leased to the state for Huntington Beach State Park. The gardens, historic plantation sites, and their adjacent residence 'Atalaya Castle' are a National Historic Landmark, and on the National Register of Historic Places. In that same year, working with Newport News Shipbuilding and Drydock Company president Homer L. Ferguson, Huntington founded the Mariners' Museum in Newport News, Virginia, one of the largest maritime museums in the world. In 1936, Huntington created an endowment which established an annual stipend for a Consultant in Poetry to the Library of Congress, now officially the Poet Laureate Consultant in Poetry to the Library of Congress. In 2006, this stipend amounted to $40,000 per year, including a $35,000 salary and $5,000 in travel expenses. From 1932-39, the Huntingtons donated what was to become the 15,000 acre Archer Milton Huntington and Anna Hyatt Huntington Wildlife Forest, in Newcomb, New York, now part of the State University of New York College of Environmental Science and Forestry. In 1939, the Huntingtons donated their mansion at 1083 Fifth Avenue and adjacent properties between 89th & 90th Streets to the National Academy, the oldest artists' organization in the United States. The property is home to the National Academy Museum and Art School. Huntington family members included several prominent cousins. The New York City architect Charles P. Huntington was one. His cousin Henry E. Huntington founded the renowned The Huntington Library, Art Collections and Botanical Gardens in California. ^ "Huntington, Archer Milton". Who's Who. Vol. 59. 1907. p. 899. ^ E., JASINSKI, LAURIE (15 June 2010). "HUNTINGTON, ARCHER MILTON". www.tshaonline.org. ^ "Ships for Tourists will be Chartered," NY Evening Post, Aug. 12, 1914. ^ "The Provinces of Spain". Media Center for Art History at Columbia University. Retrieved 21 April 2013. ^ Burke, Marcus. "A Collection in Context: The Hispanic Society of America". Media Center for Art History at Columbia University. Retrieved 21 April 2013. These murals can be seen in detail online at this Web site. In the First Floor map at the upper right, click on the blue dot in the left-most empty room -- which shows the whole Sorolla Room. ^ "Huntington Gives Site for Academy; Men of Arts and Letters to Erect Building Near Riverside Drive and 155th St. Next to Hispanic Museum; National Institute and American Academy Accept Offer of Eight City Lots for Site," New York Times. January 25, 1915. ^ "Librarian of Congress Appoints Donald Hall Poet Laureate". ^ Communications, SUNY-ESF Office of. "SUNY-ESF Web". www.esf.edu. ^ "History — National Academy Museum". National Academy. Retrieved 1 December 2012. ^ Charles P. Huntington; of 18 West 31st Street, New York City. Archer and Anna Hyatt Huntington Sculpture Garden - "Biography, The Huntingtons"
This page was last edited on 10 February 2019, at 12:37 (UTC).